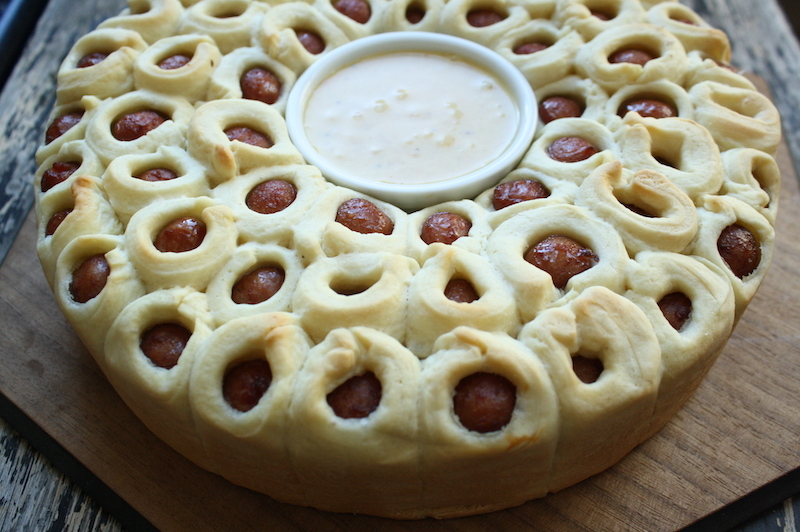 Around the same time, a chef friend of mine made a pull apart pigs in a blanket thing for a party – mini sausages wrapped in crescent dough, nestled all snuggly into a cake pan and baked into a glorious round until golden brown. Brilliant. I wanted one. Being house bound due to this lovely polar vortex, I decided to make one. Why not? What else was I going to do with those sausages I bought for something else and never used? It would sustain me through these freezing temps since there’s no way in hell I was leaving my house. 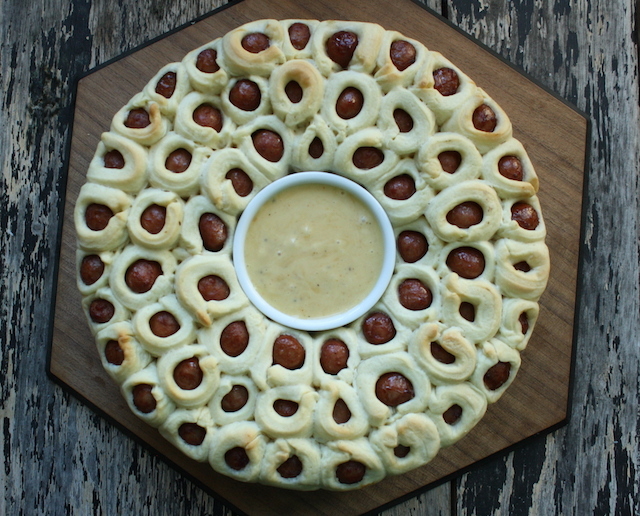 More importantly, this kind of thing would be the ideal Super Bowl party appetizer. The timing was perfect. But I decided to do things a bit differently. While puff pastry wrapped sausages are lovely, they really need to be baked individually to crisp up correctly. A pull apart with puff pastry wouldn’t quite work – too much raw dough in the center. So I turned to the other classic dough – crescent – but no whack-a-tubes for me. Homemade dough all the way. The good news is, the dough is easy. It comes together fairly quickly in a stand mixer but could be made by hand too with no problem. After a nice rise, it’s rolled, cut and wrapped around the fat little sausages. I chose all beef “lil’ smokies” but there are a wide variety of sausages available to please your guests and your budget. If you wanted to get a little extra, you could spread the dough with various things to pump up the flavor – a smear of mustard, a bit of sriracha, a sprinkle of spices – before rolling up. Choose your pan – I recommend a 9” round pan because it fit 2 packages of sausages nearly perfectly but there will be extra dough (which I made into rolls). If you wanted to use all the dough, go for a 10” pan and 3 packs of sausages. Consider the type of pan too. A springform or a pan with a removable bottom would make the unmolding easier but a standard cake pan works too. Whichever you choose, there are some tricks for easier baking and unmolding. One, line the pan with a strip of parchment around the edge to prevent any sticking. Two, place a bowl/ramekin, the same size as you’ll use for your dipping sauce, in the center. It works as a placeholder obviously but it also helps with even baking. The heat takes a bit longer to reach the center so rather than deal with underbaked center pieces, put a bowl there to help the ring bake nice and evenly. For the sauce, I include a recipe for honey mustard, but use what you like. Ketchup? Sure. Ranch. Uh huh. Beer cheese? You bet! Whatever sounds good, do it. STRESS THERAPY BAKING FACTOR: A HIT! This has the markings of an all round hit. 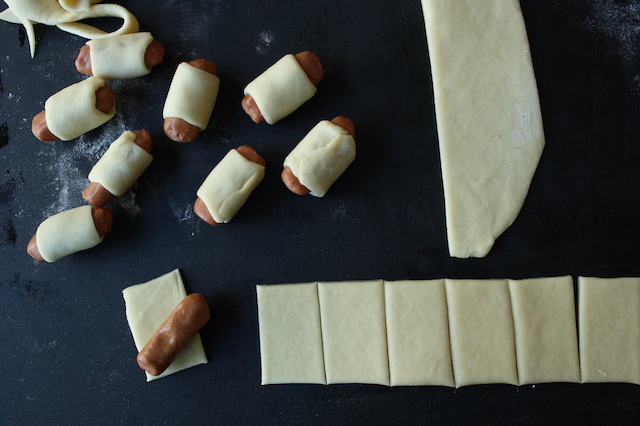 Everyone loves little sausages wrapped in dough. That’s a given but this ups the ante a few times. One: homemade dough. It’s not quite the same as tubed crescent dough but it tastes better. Two: it’s impressive as hell. 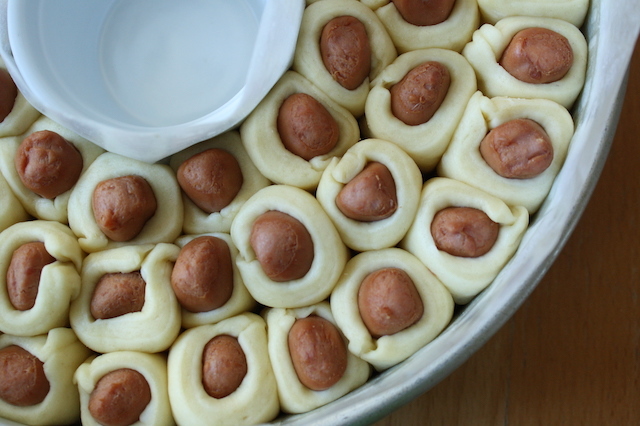 A big fat ring of pigs in a blanket will make folks do a double take. Three: it is the ultimate in portable snacking. Folks will pick and pull at this thing until it’s gone. Four: it’s easily customizable. Vegetarians? Use veggie sausages. Heat heads? Spread the dough with a chile paste and use a spicy dipping sauce. Add a bit of cheese with the hot dogs for a cheese-dog version. Change up the sauce. Sprinkle with sesame seeds or flaky salt or everything bagel spice before baking. You get the picture. And finally … it’s funny. C’mon, it is. You know it is. A few notes: You can use a 9” springform or cake pan, though the springform pan with it’s removable sides will be a bit easier to manage when you have to unmold the hot baked ring. 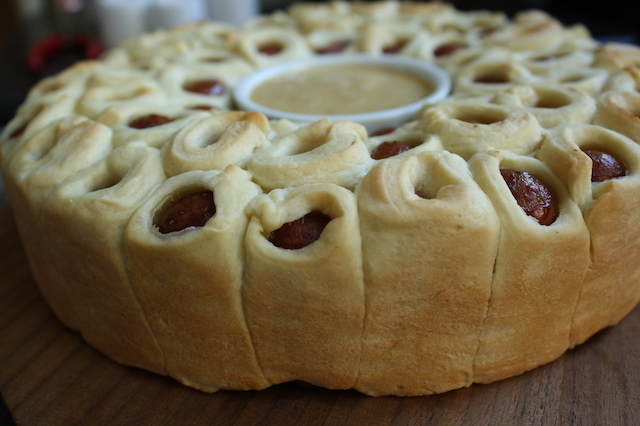 You’ll also need to bake the ring with some sort of placeholder for the sauce bowl in the center. It can be another bowl or ramekin of the same size or in a pinch, a wadded up ball of foil will work too. Also, a 12-ounce package of lil’ smokies typically has 30-32 sausages. If you have any extra dough (you likely will), see the bottom of the recipe for making rolls. For the dipping sauce:Combine ingredients in a small bowl until well combined. Transfer the dipping sauce into a bowl the same size as the one you will use in the center of the ring and refrigerator several hours to allow the flavors to blend (overnight if possible). For the dough: In the bowl of a standing mixer, dissolve yeast in warm water. To the bowl, add the butter, buttermilk, egg, salt, sugar and 2 cups of the flour and mix with the dough hook on medium-high until smooth. Stir in remaining flour and mix on medium to medium-high to form a soft dough, about 4-5 minutes. Turn the dough onto a floured surface; knead until smooth and elastic, about 6-8 minutes. Place the dough in a greased bowl, turning once to grease the top. Cover and let rise in a warm place until doubled, about 1 – 1 ½ hours. Prep the baking pan: Spray the bottom and sides of a 9” cake or springform pan (see note above) lightly with cooking spray. Cut a piece of parchment to fit the circumference of the pan. Spray the parchment lightly with cooking spray. Cut another piece of parchment large enough to surround an oven safe bowl or ramekin (this will be for the dip later) and spray the parchment lightly with cooking spray. Place the bowl in the center of the pan and wrap with the parchment (oiled side out). Set aside. To assemble: Turn the dough onto a lightly floured surface and divide into four pieces. Dab a small bit of water on one end of the dough, place a sausage at one end and roll up. Pinch the ends to seal and then roll gently, seam side down, with the palm of your hand to fully seal. Line the wrapped sausages vertically around the outside of the pan, with the seam toward the center, and continue until the pan is filled and sausages are snug, but not too tightly packed together. You want to leave a little room for the dough to rise. If the pan is full but you have extra wrapped sausages, place the extras on a parchment lined sheet pan, cover with plastic wrap and set aside. Let rise, covered, in a warm place until doubled, about 45-60 minutes. To bake: preheat the oven to 350°F with a rack in the lower third of the oven. Spray a piece of foil with cooking spray and place on the top of the pan. Remove the foil from the pan, rotate and bake for another 20-25 minutes until golden brown and baked through. Working quickly and carefully, remove the sausages from the pan: For the springform pan: release the outer ring, remove and discard the parchment. You can serve on the springform pan bottom or side the ring onto a serving platter. For the cake pan: have a serving plate and cutting board or large plate on hand. Give the outer parchment a pull to loosen; remove and discard. Place the cutting board/plate on top and flip the pan. Shake the pan gently to release. Remove the pan, place the serving platter on top and flip back so the ring in right side up. Remove the center bowl and replace with the dipping sauce bowl. Serve hot. Do-ahead:you can make the dough and refrigerate, before the first rise (step 7) overnight. Let come to room temperature before proceeding. I haven’t tried it, but I suspect you could roll the sausages and refrigerate the ring overnight as well. Remove from the refrigerator and let rise until doubled then bake as directed. This rise will take longer as the dough is cold but I see no reason why this wouldn’t work. Roll the dough ¼” thick and cut into triangles (the bigger the triangles, the bigger the rolls). 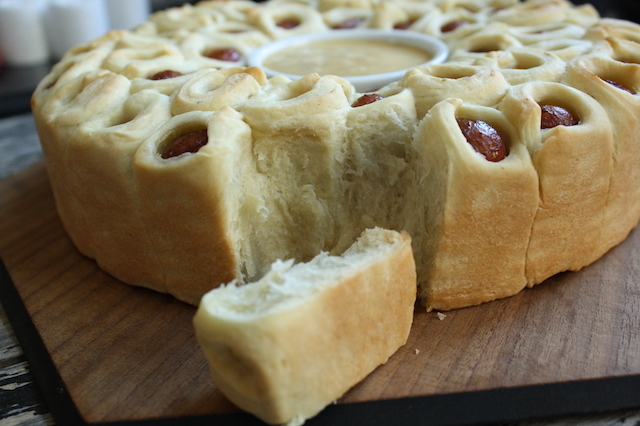 Roll up from the long end and place point side down on a parchment paper lined sheet pan. Curve the ends into a crescent shape. Cover with plastic wrap and let rise in a warm place until doubled in size, 45-60 minutes. Bake 10-12 minutes until golden brown, rotating the pan halfway through baking.